Convent, inner courtyard and dining-hall in a monumental gothic church. 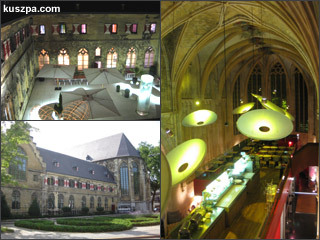 During my stay in Maastricht I slept in the designer hotel Kruisherenhotel which is a former cloister. The hotel was styled by many international internationally renowned designers like Henk Vos, Ingo Maurer, Marc Newson, Piet Heyn Eeck, Philippe Starck and Roderick Vos. It was quite fancy to stay overnight in a convent and have breakfast in a monumental gothic church. There are some pictures on the web, if you are curious.